This story originally appeared on Aug. 15, 2014. The crackdown by police in the Ferguson, Missouri in 2014 protests revealed just how militarized American law enforcement has become. But it’s not just militarization of the police that’s a problem—it’s that police departments also are taking the wrong lessons from the military. In particular, the idea that the military is all hammers … and views every problem as a nail. To be sure, police forces aren’t the military and shouldn’t be. But even the military trains for crowd control. Soldiers train for—and participate in—peacekeeping missions that require different approaches than combat does. The Army also trains to use force against demonstrators—even lethal force. But for domestic police to adopt a poor copy of military tactics neglects that the military views itself as a last resort for crowd control. And even then, there’s a wide gulf between how the military trains to deal with crowds and how the St. Louis County Police Department acted. 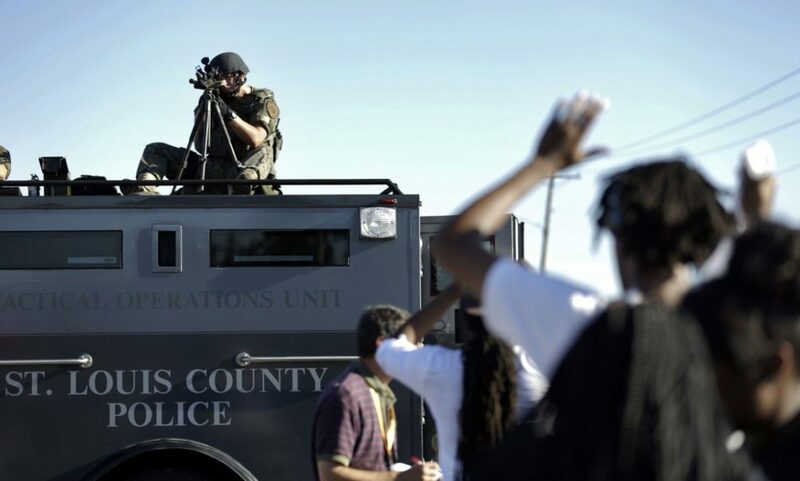 The mostly-white county police deployed surplus military vehicles and riot gear against a mostly black crowd. As the situation deteriorated, the police put on camouflage gear and cracked down even harder. They shot protesters with rubber bullets and tear gas—including gassing people standing in their own yards. Police snipers took up positions on armored vehicles. All of this rough, intimidating treatment led members of the community to ask—quite rightly—whether the police were acting not as police, but as an oppressive, occupying force. The St. Louis County police lost. As demonstrators took to the streets outraged at Brown’s death, the department emphasized a show of force. On Aug. 13, police shoved around and arrested journalists from the Washington Post and the Huffington Post. How much things changed on Thursday. The state police relieved the local police of command under the order of Missouri Gov. Jay Nixon. The troopers pulled the riot cops off the streets and the state police commander, Capt. Ronald Johnson, marched with the protesters, talked to them and got out in front of the media. The initial demands of the protesters—and investigation into the death of 18-year-old Michael Brown, are still far from met. But the shift in tactics and the marked change in how the protesters behaved shows that peacekeeping works. Even when the situation turns topsy-turvy, the Army cautions that using force can make the situation worse. Some of this appears to have happened on Sunday night. As police officers in heavy riot gear blocked roads to the city, several members of the enraged crowd looted several nearby businesses, including a QuikTrip. This retro-actively justified the repressive measures by the police and guaranteed further repression—until the state police could step in and take control of security. Had the police first attempted to de-escalate, rather than jumping to stop the protests with force, the stores might not have been looted. One of the most stunning images from the protests is of a county police sniper in camouflage on top of an armored vehicle, his rifle aimed toward the crowd. The Army recommends that crowd control lines have “lethal overwatch” support. But even here the police made things worse by displaying its snipers as a show of force, further agitating the crowd and shocking people across the country. The military teaches that snipers need to be kept at a distance, providing … you know, overwatch. Out on flanks, on top of buildings and hills. The police instead put its snipers at a risk of return fire—if the crowd had actually posed a threat. The police not only went for maximum intimidation, they needlessly exposed their own officers to return fire had that threat existed. Then there’s how the local police handled their weapons. Police stomped down the streets with rifles aimed outwards—towards people with their hands up. True, the Army gives latitude to its commanders regarding how soldiers on the peacekeeping beat carry their weapons. The safe-port position keeps the barrel aimed at the sky, with the firearm at an angle across the chest and the finger off the trigger. In practice, soldiers tend to aim the barrel down instead of up, but the effect is the same. But the police department failed on a more fundamental level—which is to first try to peacefully engage the community. This is what the state troopers are doing, and it’s what the Army recommends as a first priority. This also involves working with reporters, not arrested or tear-gassing them. “This shows [the security forces] have nothing to hide,” the field manual states.